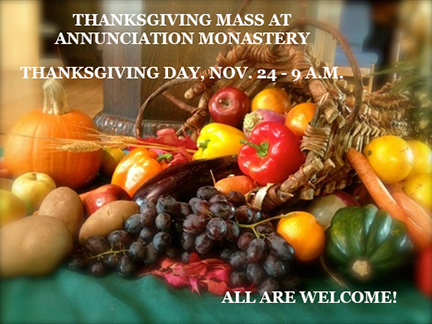 Thanksgiving Day Eucharist - All are Welcome! God, our Father, source of all goodness and love, please look kindly upon us and receive our deep gratitude on this Thanksgiving day. Thank you for the blessings and graces you bestow upon us: our faith, our family and our friends. Thank you for the abundant food and shelter, our health, the love we have for one another. Help us to be a blessing to all, with kindness and generous spirits. Dear Father, please grant us continued graces and blessing throughout the coming year.